This workout was a killer for my shoulders today, and it also targets the glutes and quads. Try to complete 3 rounds of the following exercises as quickly as you can. I completed 3 rounds in 26 mins 42 sec. I have been thinking of tailoring my workouts more for specific muscle groups. For example, maybe focusing on hamstrings, quads and calves one day then back and shoulders or abdominals etc another day. This would allow you to see how I sculpt my muscles. I’d also include some cardio to target fat loss. I will be using a variety of methods to achieve these results. Kettlebell and body weight work and I’ll also go to the gym and use the weights there. I have often focused my efforts on buliding muscle first by doing heavy weights. The more muscle you have the faster your metabolism will be thus increasing your fat burning ability even at rest. By including regular intervals of intensive cardio, such as sprints or any explosive exercises such as lunge or squat jumps, even skipping, or cycling will maximise your fat burning potential, not just during the activity, but for several hours after you’ve finished. I will be back soon with another workout, see you next time. 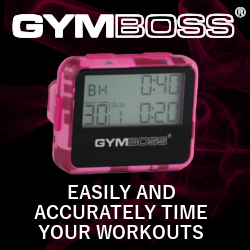 PS – If you buy a gymboss through text or banner links on my pages, I will earn a wee bit of money for that. I have been a gymboss affiliate since 2010 because I loved them then and I love them now. Especially because it one more thing I can operate that’s not on my phone.